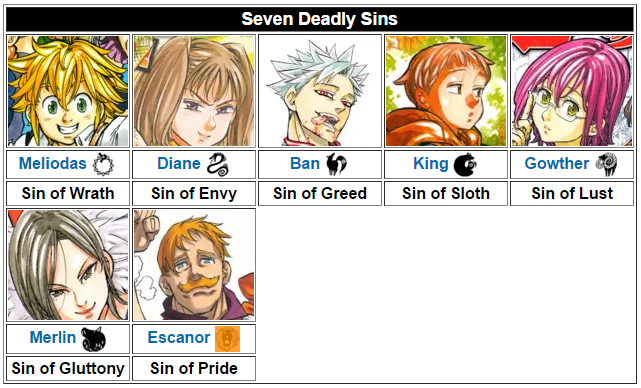 I recently watched the anime but in the end I couldn't remember who the seventh sin was. He was shown as Escanor in the first episode (about 4:43). Is it possible that he isn't showing up in the anime? Or is he impersonated by someone else? Most probably by the seventh member, you mean Escanor because he was not introduced in the anime primarily. However, if you pay attention closely, he appears in the last OVA of the Seven Deadly Sins. At 23:46 in the OVA 4, Escanor appears outside a cave carrying a barrel. He will be quite active in the recently announced sequel Seven Deadly Sins 2.